This is the best single-article summary of the current situation as of Monday. In Pioneer Square, several cracks appeared & a water main was damaged. WSDOT says the area is safe; some Councilmembers aren't convinced. With WSDOT's blessing, digging of the rescue shaft resumed on Wednesday. This week's top Bertha-related editorials: pro-tunnel & anti-tunnel. Its most controversial components are cap-and-trade & a capital gains tax. Additional revenue is needed to pay for court-mandated public K-12 costs. Republicans & Democrats in the state legislature will unveil their budgets in March. The initial 6-month pilot starts this weekend with 12 officers on Capitol Hill. 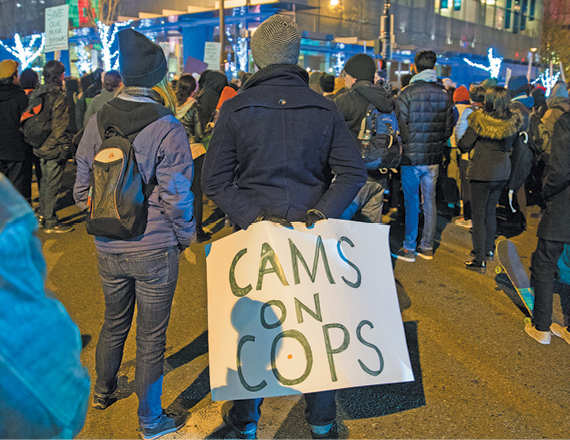 The Stranger takes a look at SPD's body camera rules for officers. The activist who almost shuttered the program talks to Seattle Weekly. SHA is a public agency that provides long-term low-income rental housing. 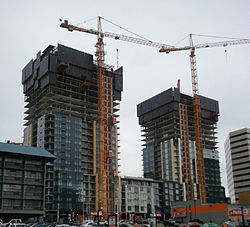 They'd proposed dramatic rent increases for current tenants. In the face of near-universal opposition, they dropped that plan Wednesday. The Stranger dives deep on the Mayor's proposed medical marijuana regulations. A state legislator wants to address the issue by merging the medical & recreational markets. Meanwhile, a new–and legal–recreational shop plans to open on Capitol Hill. Josh Cohen wrote a great affordable housing explainer for Crosscut on Monday that's recommended reading for anyone who's interested in issues related to housing affordability in Seattle today. As Josh says, "The availability (or scarcity) of affordable housing is literally shaping this city’s future, and to better understand this complex issue and its impact, you need to know how affordable housing is defined, why its shortage is being called a crisis and what city officials are doing to try to keep Seattle livable for everyone." This is your chance. 1. 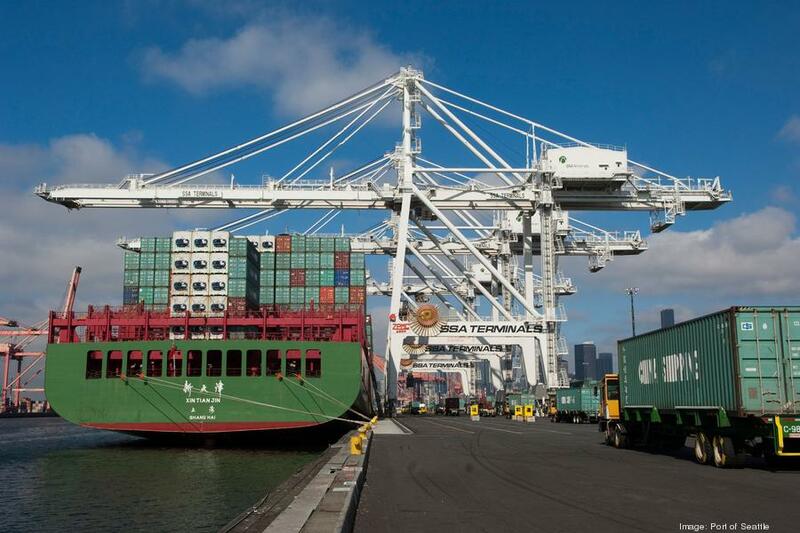 The Port slowdown is negatively impacting Washington agricultural exports. 2. King County will be rolling out a new restaurant grading system next year. 3. A Third Place Books will replace Seward Park's Columbia City-bound PCC. 4. BMW's DriveNow is looking to join the Seattle car-sharing scene next year. 5. Paseo will be back, with a new owner but the same employees & recipes. Through the end of the month, Monica Dimas from the Ethan Stowell family serves up a special menu designed to cure what ails you. An Earshot Jazz presentation, featuring a "jazz big band, vocal and instrumental soloists, gospel choir, and tap dancers" and inspired by the civil rights movement in the 60's. Perfect for anyone who's ever wanted to play around in a huge hotel room filled with teddy bears. A long-running local alternative to the more traditional Christmas shows in town. Because nothing says "Christmas" like a bunch of life-sized animatronic dinosaurs stomping around the Tacoma Dome. Fallout from Bertha's rescue efforts looks more serious than it did last week. The City Council was upset with WSDOT for withholding the news. Seattle Bike Blog: scrap the project! ; DSA: stay the course!. Next on the progressive checklist: a municipal bank? The bank would hold the City's deposits and make low-interest loans. It could finance infrastructure & policy initiatives and small business loans. A state legislator has proposed a similar model for holding marijuana funds. As expected, the School Board voted to give Larry Nyland the permanent job. Community members were upset at the lack of a full public process. Board members said the District couldn't take more turmoil at the top. First Place Scholars is a K-5 school that serves primarily homeless students. It was the first charter school to open under a law passed by voters in 2012. It was found to be out of compliance on over a dozen different points. Its principal and half its board members have resigned; its future is unclear. The feds are taxing the State taxes paid by Seattle's first recreational shop. The City is also cracking down on medical marijuana delivery services. There's no doubt about it, housing in Seattle is expensive. 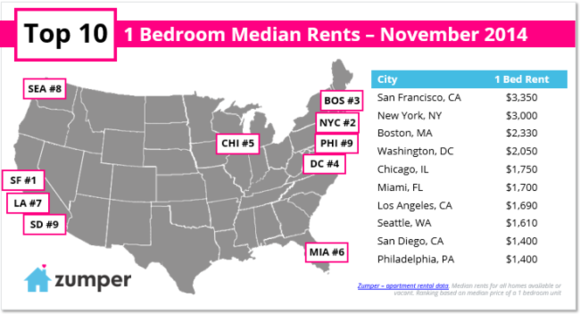 According to Zillow, rents in Seattle have increased 21% over the last 5 years, while average income has only increased 10.5%, making us the 8th most expensive rental market in America. The average Seattle renter spends just over 30% of his income on rent, as opposed to the average homeowner, who spends just over 15% on her mortgage. Curbed Seattle crunched the purchase numbers and determined that being able to afford a median-priced $359,900 home with a 20% down payment would require an annual salary of $75,098, vs. Seattle's $65,677 median household income. The median single-family home price in Seattle is $543,500, though…which by my back-of-the-envelope math would require an income of $113,398, or nearly twice Seattle's median, using Curbed's methodology. 1. The State began looking at replacing the gas tax with a per-mile driving tax. 2. Paseo's assets and name were sold at auction to the highest bidder. 3. A new study suggests that gentrification isn't Seattle's true problem; poverty is. 4. The Stranger has a good primer on body cameras in Seattle here..
5. …and tips from a former car thief on how to avoid having your car broken into here. On December 11, experience the sculpture park as you never have before—walk the path lit with the glow of hundreds of lights and luminarias. Make art, listen to music, sip a hot drink, grab a sweet bite, and take in the sights. Harold Meyerson of the Washington Post and The American Prospect in conversation with David Goldstein (formerly of The Stranger), moderated by Jerry Large from The Seattle Times. The classic 1971 version on the big screen, with "fragrant and tasty treats" from "free Wonkariffic goodie bags!" Join President Obama and millions of others around the world and spend an hour learning how to code courtesy of Seattle-based Code.org. Seattleites demonstrated daily in solidarity with Mike Brown and Eric Garner. Several protests disrupted the Black Friday shopping weekend downtown. The Stranger has an in-depth interview with one of the lead organizers here. The School Board's search for a new head of the district usually takes months. The Board announced a plan to skip that process the night before Thanksgiving. Parents are upset; the final vote is this Wednesday, 12/10. His visit was part of a campaign to get tech companies to release diversity stats. That campaign got Amazon to release their diversity numbers in October. GeekWire interviewed him about the initiative while he was here. The two Ports have historically been in competition with each other. A new interlocal agreement will allow them to effectively operate as one entity. The move comes amid stronger competition from other North American ports. 5-story drilling rig Bertha ground to a halt under Pioneer Square last December. A year later, the rescue effort is causing soil settlement under the viaduct near the dig site. Bertha was supposed to be moving again by March; that now looks unlikely. 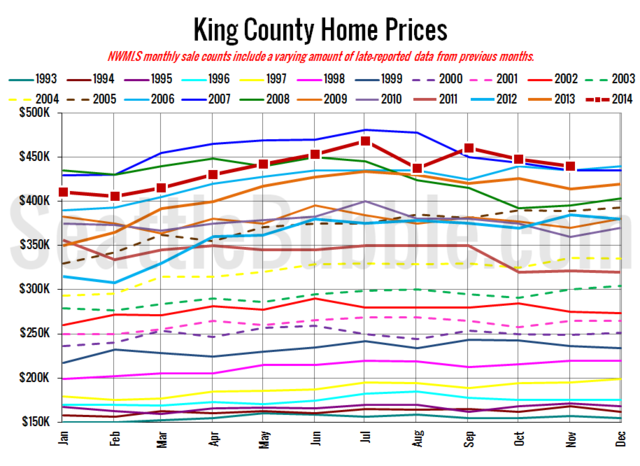 The Northwest Multiple Listing Service published their monthly press release about the state of the local market on Thursday; the main theme is that prices are up and sales are down, which is typical for this time of year. Seattle Bubble has a good run-down of press coverage of the NWMLS release, including some good advice about not listening to real estate brokers about what interest rates are likely to do in the future. 1. 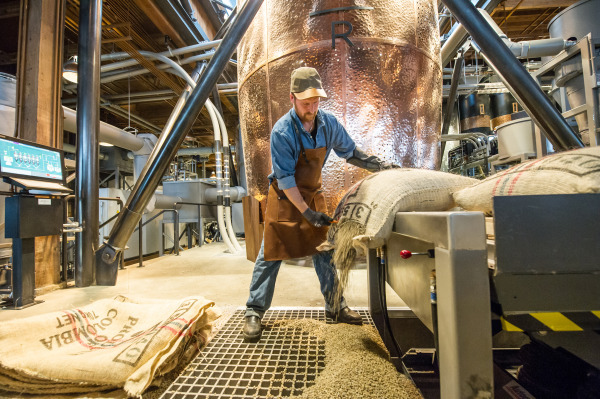 Starbucks opened "a coffee experience so large, you'll need a map" on Capitol Hill. 2. I-594's stricter gun sale background checks took effect. 3. We're poised to get a new national park and more wilderness protection this week. 4. The Harvard Exit theater is closing in January. 5. The fate of the Woodland Park Zoo's elephants is still in limbo. "Seattle's largest indie craft show." "A relaxing and enjoyable alternative to the more commercial holiday gift buying experience." A contemporary dance new works festival on Capitol Hill. A quick look back at what happened in local politics this year over lunch. Just what it sounds like–Thursdays at 6, equipment supplied. "Seattle's least predictable and best-loved flea market"; proceeds benefit the Low Income Housing Alliance. 12/13, Noon – 10 pm @ 1166 23rd Ave; $1.